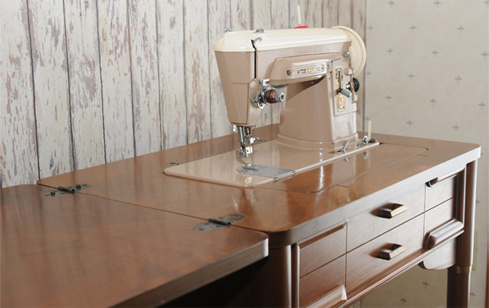 Our Singer 404 is a straight-stitch machine. (it will not sew zig-zag stitches without using accessories.) This is one of the few machines we purchased at an antique store and paid more for it than we usuall do because the machine and cabinet were in excellent condition. However, since it sews only straight stitch, it doesn't get much use. 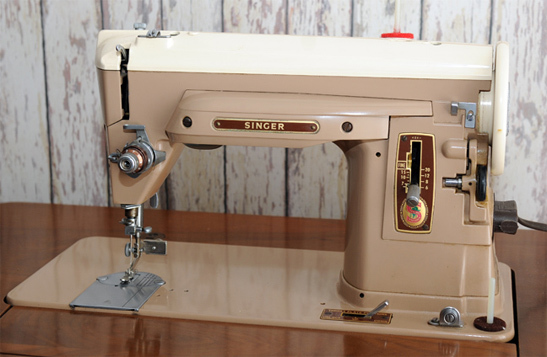 The Singer 404 is a Slant-Needle design and all accessories must be designed specifically for this machine type. The photograph above shows the few controls. The stitch length regulator is the vertical slider. Feed dogs can be lowered for free-motion work using the control on the machine's base; this control also releases the throat plate for removal. Bobbin winding is accomplished by releasing the hand-wheel clutch and pressing (and holding) the small rubber tire against the handwheel. The image at left shows our Singer 404 with a zipper foot installed. 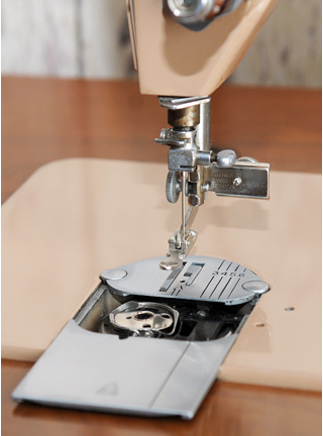 The foot has an adjustment that allows the foot to be moved left or right to accomodate various zipper sizes or stitch location. The machine has unusual serial number AN032323.